Hildo's werk: MCS 2014 press releases! Ready for some S&S wear? 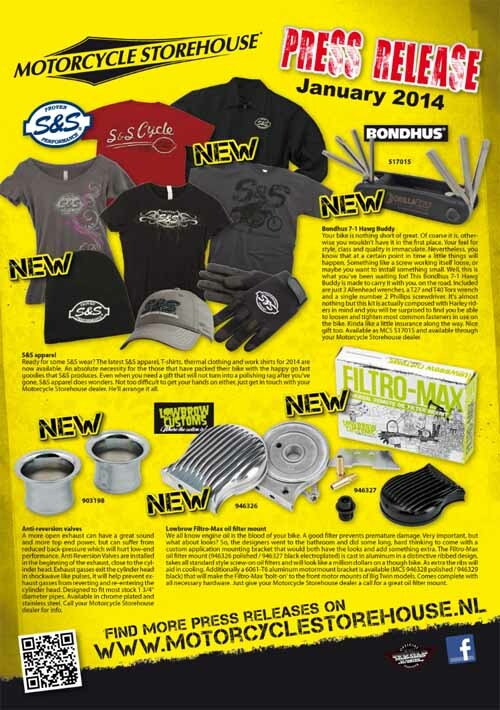 The latest S&S apparel, T-shirts, thermal clothing and work shirts for 2014 are now available. An absolute necessity for the those that have packed their bike with the happy go fast goodies that S&S produces. Even when you need a gift that will not turn into a polishing rag after you've gone, S&S apparel does wonders. Not too difficult to get your hands on either, just get in touch with your Motorcycle Storehouse dealer. He'll arrange it all. We all know engine oil is the blood of your bike. A good filter prevents premature damage. Very important, but what about looks? So, the designers went to the bathroom and did some long, hard thinking to come with a custom application mounting bracket that would both have the looks and add something extra. The Filtro-Max oil filter mount (946326 polished / 946327 black electroplated) is cast in aluminum in a distinctive ribbed design, takes all standard style screw-on oil filters and will look like a million dollars on a though bike. As extra the ribs will aid in cooling. Additionally a 6061-T6 aluminum motormount bracket is available (MCS 946328 polished / 946329 black) that will make the Filtro-Max 'bolt-on' to the front motor mounts of Big Twin models. Comes complete with all necessary hardware. Just give your Motorcycle Storehouse dealer a call for a great oil filter mount. Your bike is nothing short of great. Of coarse it is, otherwise you wouldn't have it in the first place. Your feel for style, class and quality is immaculate. Nevertheless, you know that at a certain point in time little things will happen. Something like a screw working itself loose, or maybe you want to install something small. Well, this is what you've been waiting for! This Bondhus 7-1 Hawg Buddy is made to carry it with you, on the road. Included are just 3 Allenhead wrenches, a T27 and T40 Torx wrench and a single number 2 Phillips screwdriver. It's almost nothing but this kit is actually composed with Harley riders in mind and you will be surprised to find you be able to loosen and tighten most common fasteners in use on the bike. Kinda like a little insurance along the way. Nice gift too. Available as MCS 517015 and you can get it through your Motorcycle Storehouse dealer. Give him a call, you'll be glad you did. 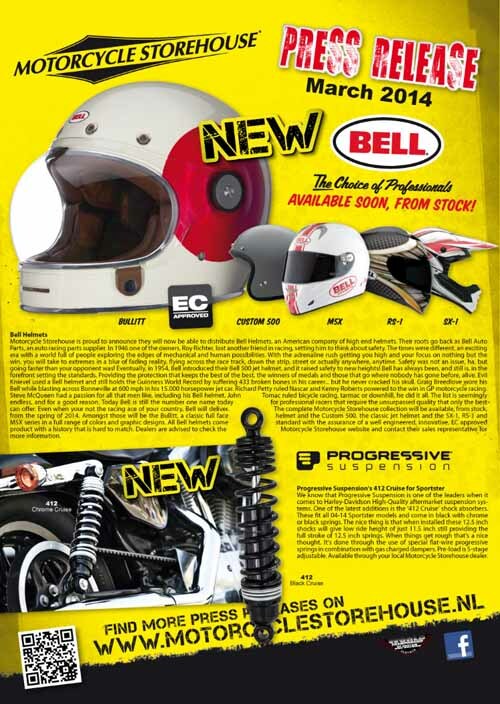 Motorcycle Storehouse is proud to announce they will now be able to distribute Bell Helmets, an American company of high end helmets. Their roots go back as Bell Auto Parts, an auto racing parts supplier. In 1946 one of the owners, Roy Richter, lost another friend in racing, setting him to think about safety. The times were different, an exciting era with a world full of people exploring the edges of mechanical and human possibilities. With the adrenaline rush getting you high and your focus on nothing but the win, you will take to extremes in a blur of fading reality, flying across the race track, down the strip, street or actually anywhere, anytime. Safety was not an issue, ha, but going faster than your opponent was! Eventually, in 1954, Bell introduced their Bell 500 jet helmet, and it raised safety to a new level! Bell has always been, and still is, in the forefront setting the standards. Providing the protection that keeps the best of the best, the winners of medals and those that go where nobody has gone before, alive. Evil Knievel used a Bell helmet and still holds the Guinness World Record by suffering 433 broken bones in his career... but he never cracked his skull. Graig Breedlove wore his Bell while blasting across Bonneville at 600 mph in his 15.000 horsepower jet car. Richard Petty ruled Nascar and Kenny Roberts powered to the win in GP motorcycle racing. Steve McQueen had a passion for all that men like, including his Bell helmet. John Tomac ruled bicycle racing, tarmac or downhill, he did it all. The list is seemingly endless, and for a good reason. Today Bell is still the number one name today for professional racers that require the unsurpassed quality that only the best can offer. Even when your not the racing ace of your country, Bell will deliver. 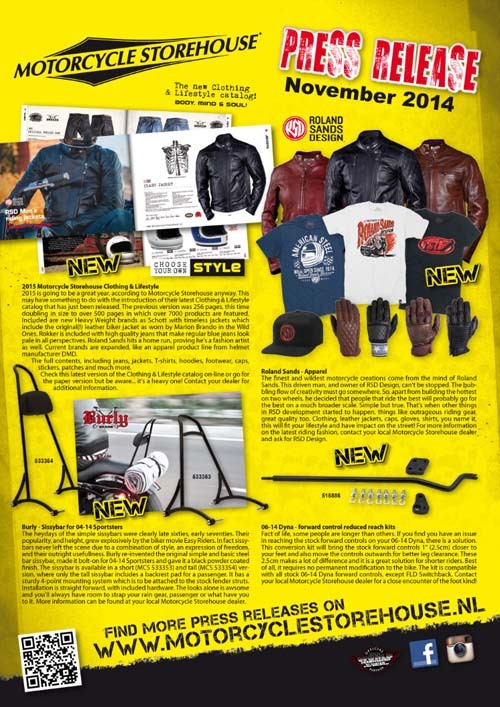 The complete Motorcycle Storehouse collection will be available, from stock, from the spring of 2014. 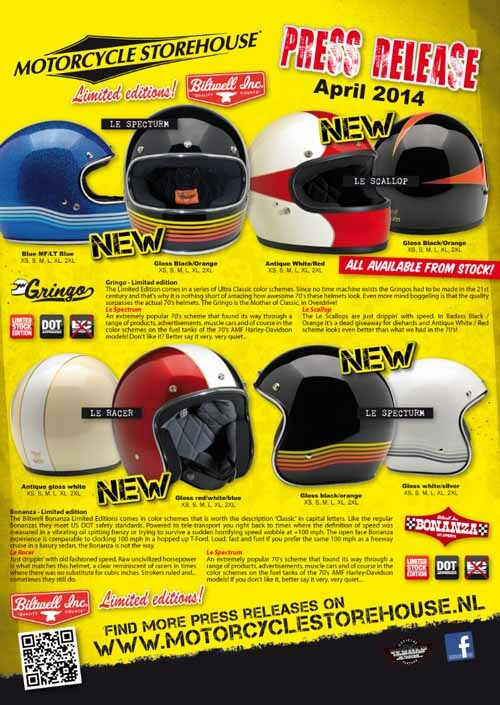 Amongst those will be the Bullitt, a classic full face helmet and the Custom 500, the classic jet helmet and the SX-1, RS-1 and M5X series in a full range of colors and graphic designs. All Bell helmets come standard with the assurance of a well engineered, innovative, EC approved product with a history that is hard to match. Dealers are advised to check the Motorcycle Storehouse website and contact their sales representative for more information. We know that Progressive Suspension is one of the leaders when it comes to Harley-Davidson High-Quality aftermarket suspension systems. One of the latest additions is the '412 Cruise' shock absorbers. These fit all 04-14 Sportster models and come in black with chrome or black springs. The nice thing is that when installed these 12.5 inch shocks will give low ride height of just 11.5 inch still providing the full stroke of 12.5 inch springs. When things get rough that's a nice thought. It's done through the use of special flat-wire progressive springs in combination with gas charged dampers. Pre-load is 5-stage adjustable. Available through your local Motorcycle Storehouse dealer. If you drive a car, wear what you want. Sneakers, short pants, T-shirts or even nothing at all, who cares? When you ride a bike things are different. 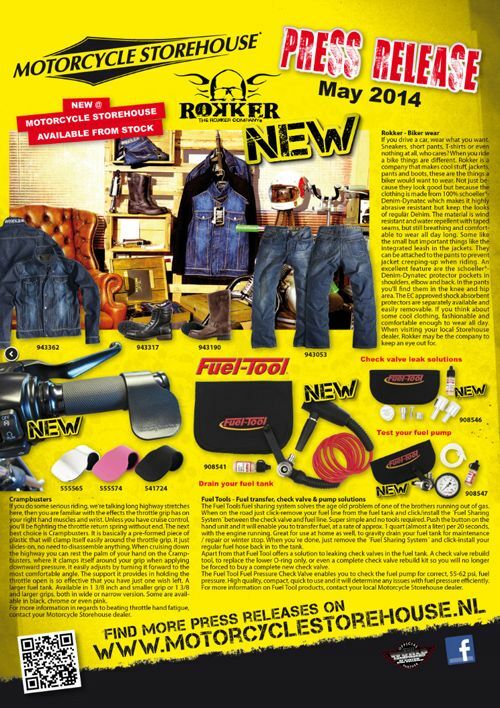 Rokker is a company that makes cool stuff, jackets, pants and boots, these are the things a biker would want to wear. Not just because they look good but because the clothing is made from 100% schoeller®-Denim-Dynatec which makes it highly abrasive resistant but keep the looks of regular Denim. The material is wind resistant and water repellent with taped seams, but still breathing and comfortable to wear all day long. Some like the small but important things like the integrated leash in the jackets. They can be attached to the pants to prevent jacket creeping-up when riding. An excellent feature are the schoeller®-Denim-Dynatec protector pockets in shoulders, elbow and back. In the pants you'll find them in the knee and hip area. The EC approved shock absorbent protectors are separately available and easily removable. If you think about some cool clothing, fashionable and comfortable enough to wear all day. When visiting your local Storehouse dealer, Rokker may be the company to keep an eye out for. French designer/manufacturer Shark has introduced their new VanTime. It is designed as a comfortable urban helmet with a fixed chin-piece an a thermo injected plastic shell based on the shell of the, very popular, Raw helmet. The shell is slightly elongated for a better fit and look smaller and comes in two shell sizes. Cool Factor score is high with the right combination of high tech features & a small sniff of retro which makes this helmet compliment virtually any bike. The design is complemented by innovative design features including excellent suitability for riders wearing glasses, you can put them on and off without issues. A quick on and off, adjustable shell ventilation, a visor de-misting feature and tested aerodynamics at high speeds. Both the integrated sun visor and outer visor are easily one-hand deployed, The outer visor will lower beneath your chin for maximum protection against the elements. Helmet is lining is made with natural bamboo fibers. Available in Gloss Black, Gloss White, White and Silver in XS to XL. Contact your Motorcycle Storehouse dealer for more information. ECE approved helmet with a aesthetic appearance. Compact looks with a maximum of dramatic effect, clearly showing its aggressive genes as a direct descendent of Shark's Raw. The VanCore comes with a fixed chin bar to add genuine full face protection and includes the latest Shark innovations. Like the comfortable interior made of natural bamboo fibre and the slide-open, slide-closed ventilation as found on the top of the shell. The interior has a re-designed lining to accommodate riders with glasses that are now easy to put on and take off. The integrated nose piece will help avoid fogging-up of the goggle at the traffic light in the rain, apart from goggle features like the Double Blade anti-fog and anti-scratch and the one-hand quick release system. Available in Gloss Black, Matte Black, White Azur and Matte Green in XS to XL. 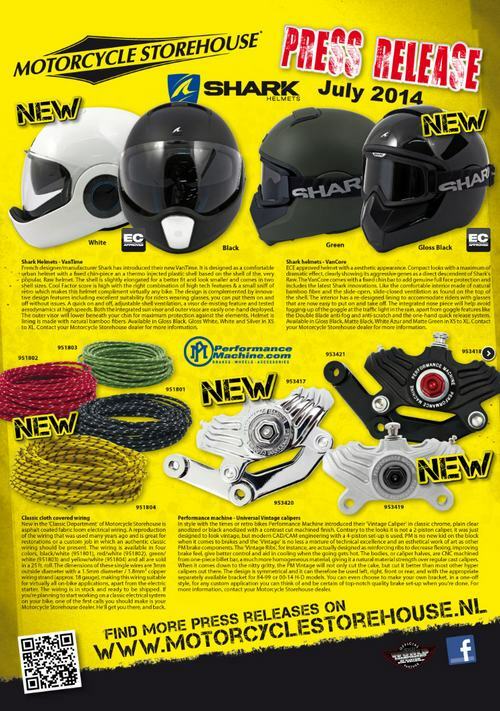 Contact your Motorcycle Storehouse dealer for more information. New in the 'Classic Department' of Motorcycle Storehouse is asphalt coated fabric loom electrical wiring. A reproduction of the wiring that was used many years ago and is great for restorations or a custom job in which an authentic classic wiring should be present. The wiring is available in four colors, black/white (951801), red/white (951802), green/white (951803) and yellow/white (951804) and all are sold in a 25 ft. roll. 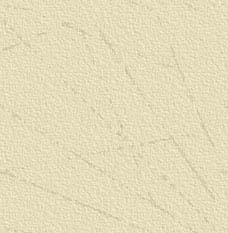 The dimensions of these single wires are 3mm outside diameter with a 1.5mm diameter / 1.8mm² copper wiring strand (approx. 18 gauge), making this wiring suitable for virtually all on-bike applications, apart from the electric starter. The wiring is in stock and ready to be shipped. If you're planning to start working on a classic electrical system on your bike, one of the first calls you should make is your Motorcycle Storehouse dealer. He'll get you there, and back. In style with the times or retro bikes Performance Machine introduced their 'Vintage Caliper' in classic chrome, plain clear anodized or black anodized with a contrast cut machined finish. Contrary to the looks it is not a 2-piston caliper, it was designed to look vintage, but modern CAD/CAM engineering with a 4-piston set-up is used. PM is no new kid on the block when it comes to brakes and the 'Vintage' is no less a mixture of technical excellence and an esthetical work of art as other PM brake components are. The 'Vintage Ribs', for instance, are actually designed as reinforcing ribs to decrease flexing, improving brake feel, give better control and aid in cooling when the going gets hot. The bodies, or caliper halves, are CNC machined from one-piece billet bar, a much more homogeneous material, giving it a natural material strength over regular cast calipers. When it comes down to the nitty gritty, the PM Vintage will not only cut the cake, but cut it better than most other hyper calipers out there. The design is symmetrical and it can therefore be used left, right, front or rear, and with the appropriate separately available bracket for 84-99 or 00-14 H-D models. You can even choose to make your own bracket, in a one-off style, for any custom application you can think of and be certain of top-notch quality brake set-up when you're done. For more information, contact your Motorcycle Storehouse dealer. 'Gotta rake your baggah boy!!' That's something you could hear your dealer say when you contemplate the installation of a large front wheel. As you know a large diameter front wheel cannot be installed as a direct replacement of the stock wheel, you will need to rake your forks. The solution is made by Arlen Ness. He designed a series of special triple trees which are used to rake your forks and are to be used in combination with specific large wheel diameters. An 11° rake is designed to be used with 21" (4.5" trail), 23" (5.25" trail) or 26" (6" trail) wheels only. The 7° is to be used with 23" (7" trail) or 21" (6 1/8" trail). Note that Ness 'KO' triple trees are designed with large wheels only and will not handle correctly with stock wheels. Available in 11 & 7 degrees for 97-13 Touring models, with 41mm forks and in 7 degree for 2014 Touring models equipped with 49mm forks. Installing the right Ness 'KO' raked triple tree set will guarantee a good ride with that large front wheel and give absolute killer looks. So... Go Go Go and contact your Motorcycle Storehouse dealer for more information! 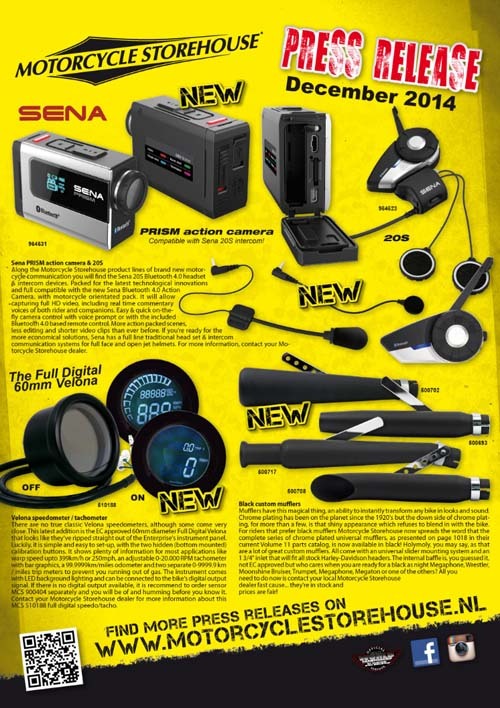 Motogadget is a well know supplier, based in Germany, for various high tech and electronic equipment. Some time ago the 'M-Blaze' turn signals were introduced. These are used inside the handlebar, giving a truly custom look due to the design and combination of LEDs and clear transparent reflecting glass-like material. The very flat M-Blaze Disc, with 7W power LEDs, is a variation on that design. They are also to be used inside the handlebar, with an inside diameter of 14mm to 21mm, which includes all regular 22mm (7/8”) and 1 inch (25.4mm) bars. The latest addition is the M-Blaze Ice, with 3W power LEDs, designed as a regular replacement turn signal and comes with an 8mm threaded stud. No matter what rings your bell, you’ll get noticed in more ways than one since the combination of Power LEDs and the 'Special 180° Lighting Effect' gives an awesome look and a clear, safe and functional EC approved turn signal system. Available in polished and black anodized aluminum and complete with pre-installed 1 meter wiring. Contact your local Motorcycle Storehouse dealer, he’s the one to talk to when Motogadget is on your mind. Real time, tire pressure monitoring! A TPMS is a wireless ‘Tire Pressure Monitoring System’. It will allow you to know what your tire pressure is, at any moment prior, before, after or even during the ride, in real-time! Includes an LCD monitor and two valve cap sensors. Comes with PSI / BAR indication and allows user pre-set values. Will give an audible / vibration alert when tire pressure raises or drops below user set level. Available as MCS 521200. These aluminum fenders are made of extra thick precision die-stamped and CNC cut from 6061-T6 aluminum. Fenders are finished in raw (MCS 946358), great to paint or polish. All ‘ready to go’, you can choose from the black anodized (MCS 946359) or grey anodized (MCS 946360) over sandblasted aluminum. Easy to install, the only modification is cutting-off the large rear fender struts. After that frame modification the Tsunami is a direct replacement for the stock 94-03 XL rear fender and installs with stock hardware. You cannot believe the wave of style this fender packs and how much it improves the look of your bike. Give your Sportster a chance, she deserves it! 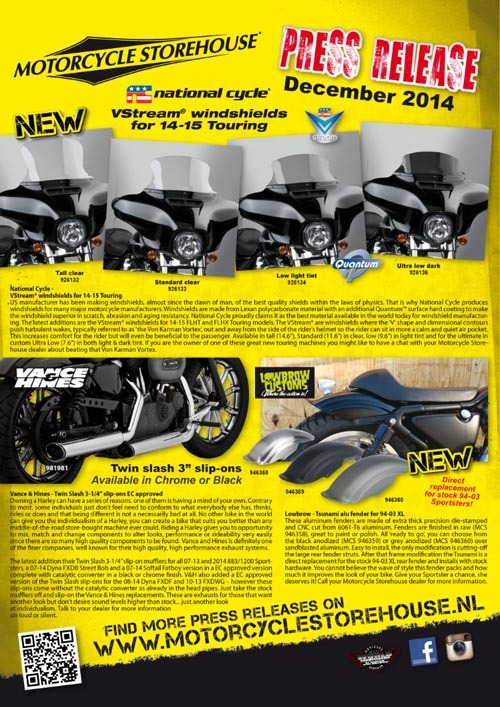 Call your Motorcycle Storehouse dealer for more information. If you're running a Sportster 883, and want extra muscle, a free flowing air cleaner and mufflers are first. The next logical step is a big bore piston set that will convert your Sporty to 1200cc since, no matter what sportsbike enthusiasts claim, we all know there is no substitute for cubic inches in the real world! To fully benefit from your 883-1200 conversion S&S has a brand new 482 camshaft set, especially designed for 883/1200 conversion kits. Nothing extreme, it is designed as bolt-in and to work with all stock components. Just a minor cam lobe clearancing is required to clear the crankcase. Afterwards you'll beat a stock 1200 in the power department since S&S claims a +5 horsepower and +2ft-lb torque increase, over the stock 1200. Fits all 2000-2014 XL 883 models and will fit 91-99 XL models when a 00-14 style pinion gear (OEM 24047-00) is installed to match the pitch on the second cam. The S&S 482 camshaft set is available as MCS 536552. If you're ready to wake up your 883, contact your Motorcycle Storehouse dealer. Drag pipes are classics in their own right. Originated on the race track, but a lot used on the street. However, you may have noticed, times have changed and the true roar of 2" drag pipes is a serious sound. For a little trip back in time these 2" drag pipe extensions have it all. They do not require the complete removal of your exhaust system, just the stock mufflers are exchanged for the extensions and voilà! The drag pipe extensions are equipped with removable mufflers so you could go a little quieter, if you feel like it. Fits stock head pipes and exhaust hanger bracket on 04-13 XL1200 and 07-13 XL883 models. Contact your Motorcycle Storehouse dealer for additional info. The Limited Edition comes in a series of Ultra Classic color schemes. Since no time machine exists the Gringos had to be made in the 21st. century and that's why it is nothing short of amazing how awesome 70's these helmets look. Even more mind boggeling is that the quality surpasses the actual 70's helmets. The Gringo is the Mother of Classic, in Overdrive! The Le Scallops are just drippin’ with speed. In Badass Black / Orange it’s a dead giveaway for diehards and Antique White / Red scheme looks even better than what we had in the 70’s! The open face Biltwell Bonanza Limited Editions comes in color schemes that is worth the description 'Classic' in capital letters. Like the regular Bonanzas they meet US DOT safety standards. Powered to tele-transport you right back to times where the definition of speed was measured in a vibrating oil spitting frenzy or trying to survive a sudden horrifying speed wobble at +100 mph. The open face Bonanza experience is comparable to clocking 100 mph in a hopped up T-Ford. Loud, fast and fun! If you prefer the same 100 mph as a freeway cruise in a luxury sedan, the Bonanza is not the way. Just drippin' with old fashioned speed. Raw uncivilized horsepower is what matches this helmet, a clear reminiscent of racers in times where there was no substitute for cubic inches. Strokers ruled and... sometimes they still do. Winston Yeh is The Man behind Rough Crafts. A well known Taiwanese builder and designer of exotic custom bikes. Parts are exclusively made small scale high quality in-house productions, and used on Rough Crafts bikes. These parts reflect another Taiwan that many of us never new existed... a land of individualism and freedom. Winston is on the forefront of discovering new custom worlds. Softly spoken and with a deep interest in what moves a man's soul, an explorer of the fine line between devotion, ecstasy, agony even. An intense artist like Winston can not live, when his dedication to meet his creative desires are not met. It is not the money, it is the devotion to create in the purest sense of the word. This is why Winston Yeh is embraced by those that have a sense of taste that surpasses the average. Only those can appreciate Rough Crafts creations for what they really are, way more than what meets the eye, art on which a price tag is almost an insult. 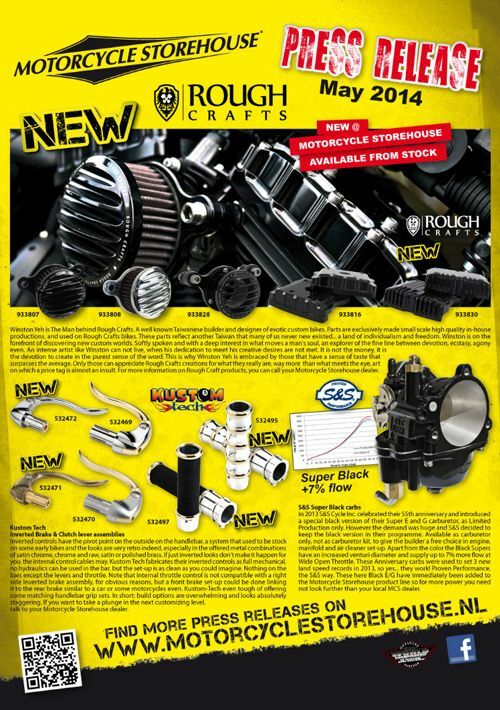 For more information on Rough Craft products, you can call your Motorcycle Storehouse dealer. Inverted controls have the pivot point on the outside on the handlebar, a system that used to be stock on some early bikes and the looks are very retro indeed, especially in the offered metal combinations of satin chrome, chrome and raw, satin or polished brass. If just inverted looks don't make it happen for you, the internal control cables may. Kustom Tech fabricates their inverted controls as full mechanical, no hydraulics can be used in the bar, but the set-up is as clean as you could imagine. Nothing on the bars except the levers and throttle. Note that internal throttle control is not compatible with a right side inverted brake assembly, for obvious reasons, but a front brake set-up could be done linking it to the rear brake similar to a car or some motorcycles even. Kustom-Tech even tough of offering some matching handlebar grip sets. In short: build options are overwhelming and looks absolutely staggering. If you want to take a plunge in the next customizing level, talk to your Motorcycle Storehouse dealer. In 2013 S&S Cycle Inc. celebrated their 55th. anniversary and introduced a special black version of their Super E and G carburetor, as Limited Production only. However the demand was huge and S&S decided to keep the black version in their programme. Available as carburetor only, not as carburetor kit, to give the builder a free choice in engine, manifold and air cleaner set-up. Apart from the color the Black Supers have an increased venturi diameter and supply up to 7% more flow at Wide Open Throttle. These Anniversary carbs were used to set 3 new land speed records in 2013, so yes... they work! Proven Performance, the S&S way. The black E/G carburetors have immediately been added to the Motorcycle Storehouse product line so, for more power you need not look further than your local MCS dealer. In life different things can be important at different times. If you're a long distance cruiser, with the emphasis on comfort, this may not be your product. On the other hand, if your thing is rough, rowdy and tough, keep on reading. The Bob Fester fuel tanks don't hold much fuel, around 2.35 gallon can be expected, but the looks will compliment the chopper or bobber a lot better than the average fuel tank and that is, in all honesty, quite important. The Bob Fester tanks are center ribbed, for that true retro look, include mounting hardware and come with a flush pop-up chrome plated gas cap. 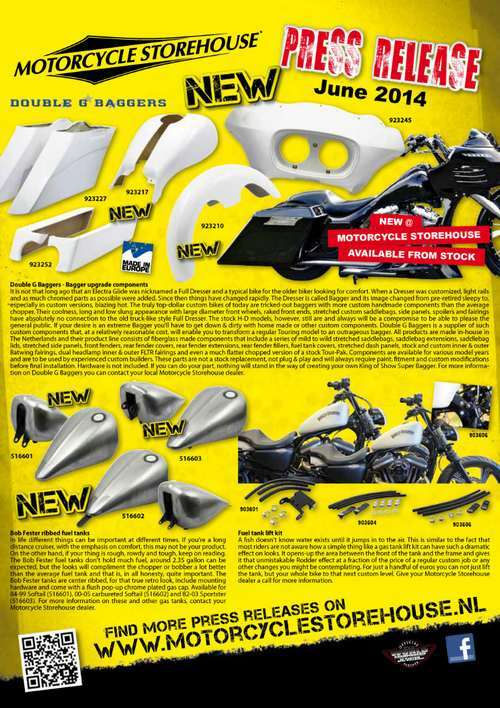 Available for 84-99 Softail (516601), 00-05 carbureted Softail (516602) and 82-03 Sportster (516603). For more information on these and other gas tanks, contact your Motorcycle Storehouse dealer. A fish doesn't know water exists until it jumps in to the air. This is similar to the fact that most riders are not aware how a simple thing like a gas tank lift kit can have such a dramatic effect on looks. It opens-up the area between the front of the tank and the frame and gives it that unmistakable Rodder effect at a fraction of the price of a regular custom job or any other changes you might be contemplating. For just a handful of euros you can not just lift the tank, but your whole bike to that next custom level. Give your Motorcycle Storehouse dealer a call for more information. Sometimes things get blurry. Traveling at extreme speeds can have that effect, but as age progresses blurriness is less thrilling. At a certain point your arms are just not long enough to still see that road map or smartphone. On the bike you have trouble seeing the instrument gauges or navigation. Bummer! The solution is near and clear views are close since Anderson comes with bifocal sunglasses. Andersons are fully designed and manufactured as motorcycle sunglasses, complete with shatter resistant polycarbonate lenses with UV400 protection and a scratch protective coating. Great news since now you can have regular high quality riding glasses, and bifocals at the same time. See the road ahead and your instruments in one go, Everything back in focus! These bifocals will pay for themselves just by preventing more speeding tickets. All Anderson sunglasses are available in three styles, Denver, Phoenix and Tampa, with clear or smoke lens in +1.50 to +2.50 with 0.25 increments. Call your Motorcycle Storehouse dealer for more information on clear views. 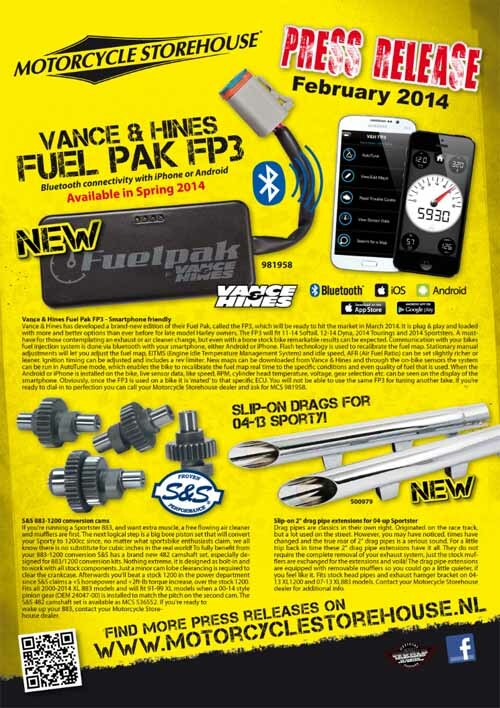 2015 is going to be a great year, according to Motorcycle Storehouse anyway. This may have something to do with the introduction of their latest Clothing & Lifestyle catalog that has just been released. The previous version was 256 pages, this time doubling in size to over 500 pages in which over 7000 products are featured. Included are new Heavy Weight brands as Schott with timeless jackets which include the original(!) leather biker jacket as worn by Marlon Brando in the Wild Ones. Rokker is included with high quality jeans that make regular blue jeans look pale in all perspectives. Roland Sands hits a home run, proving he's a fashion artist as well. Current brands are expanded, like an apparel product line from helmet manufacturer DMD. The full contents, including jeans, jackets, T-shirts, hoodies, footwear, caps, stickers, patches and much more. Check this latest version of the Clothing & Lifestyle catalog on-line or go for the paper version but be aware... it's a heavy one! Contact your dealer for additional information. The heydays of the simple sissybars were clearly late sixties, early seventies. Their popularity, and height, grew explosively by the biker movie Easy Riders. In fact sissy­bars never left the scene due to a combination of style, an expression of freedom, and their outright usefullness. Burly re-invented the original simple and basic steel bar sissybar, made it bolt-on for 04-14 Sportsters and gave it a black powder coated finish. The sissybar is available in a short (MCS 533353) and tall (MCS 533354) version, where only the tall sissybar includes a backrest pad for a passenger. It has a sturdy 4-point mounting system which is to be attached to the stock fender struts. Installation is straight forward, with included hardware. The looks alone is awsome and you'll always have room to strap your rain gear, passenger or what have you to it. 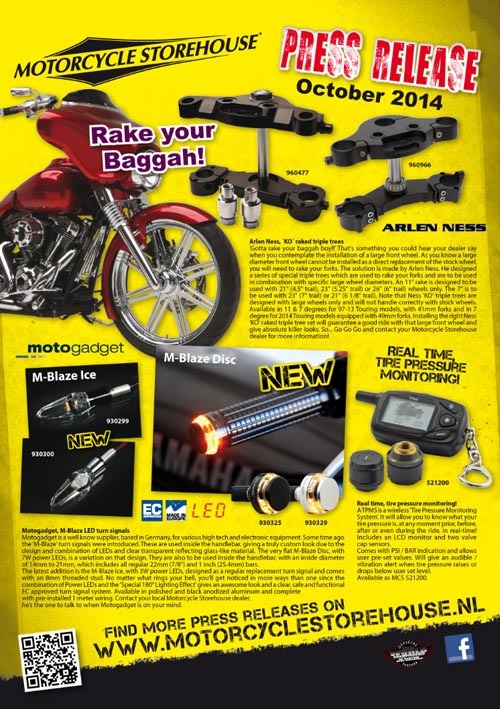 More information can be found at your local Motorcycle Storehouse dealer. Fact of life, some people are longer than others. If you find you have an issue in reaching the stock forward controls on your 06-14 Dyna, there is a solution. This conversion kit will bring the stock forward controls 1" (2.5cm) closer to your feet and also move the controls outwards for better leg clearance. These 2.5cm makes a lot of difference and it is a great solution for shorter riders. Best of all, it requires no permanent modification to the bike. The kit is compatible with all stock 06-14 Dyna forward controls, except FLD Switchback. 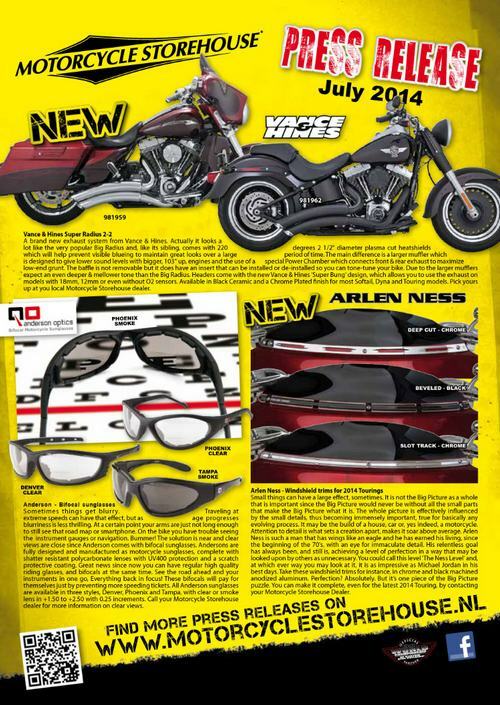 Contact your local Motorcycle Storehouse dealer for a close encounter of the foot kind! There are no true classic Velona speedometers, although some come very close. This latest addition is the EC approved 60mm diameter Full Digital Velona that looks like they've ripped straight out of the Enterprise's instrument panel. Luckily, it is simple and easy to set-up, with the two hidden (bottom mounted) calibration buttons. It shows plenty of information for most applications like warp speed upto 399km/h or 250mph, an adjustable 0-20.000 RPM tachometer with bar graphics, a 99.9999km/miles odometer and two separate 0-9999.9 km / miles trip meters to prevent you running out of gas. The instrument comes with LED background lighting and can be connected to the bike's digital output signal. If there is no digital output available, it is recommend to order sensor MCS 900404 separately and you will be of and humming before you know it. Contact your Motorcycle Storehouse dealer for more information about this MCS 510188 full digital speedo/tacho. Mufflers have this magical thing, an ability to instantly transform any bike in looks and sound. Chrome plating has been on the planet since the 1920's but the down side of chrome plating, for more than a few, is that shiny appearance which refuses to blend in with the bike. For riders that prefer black mufflers Motorcycle Storehouse now spreads the word that the complete series of chrome plated universal mufflers, as presented on page 1018 in their current Volume 11 parts catalog, is now available in black! Holymoly, you may say, as that are a lot of great custom mufflers. All come with an universal slider mounting system and an ­ 1 3/4" inlet that will fit all stock Harley-Davidson headers. The internal baffle is, you guessed it, not EC approved but who cares when you are ready for a black as night Megaphone, Wrestler, Moonshine Bruiser, Trumpet, Megaphone, Megaton or one of the others? All you need to do now is contact your local Motorcycle Storehouse dealer fast cause... they're in stock and prices are fair!